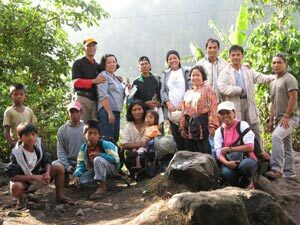 GRN Philippines Staff and Board Members on their outreach to the Kalinga - Jurine (orange cap) with Edith Tolentino, Ate Eva (centre, back) and Mary Ann (red shirt). In April this year, Gospel Recordings Philippines responded to that question and conducted a short-term mission. We called it, "Kawa-Saka". 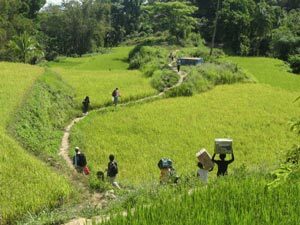 The mission was dedicated to reaching the Butbut, Gui'layon, Balatoc, Lubuagan and the Tulgao people of the Kalinga group in the mountain ranges of Kalinga Province. 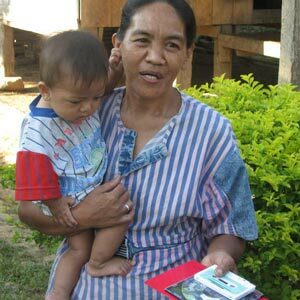 We had recently made recordings of the 'Good News', the Look, Listen & Live, and The Living Christ series, with songs of salvation, in their own KALINGA languages. The Kalinga area is 500 kilometres north of Manila. Transport included a vehicle (as above) and a five hour walk. 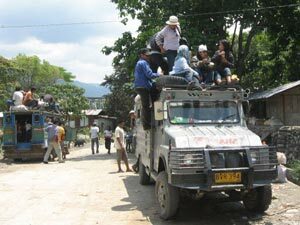 We stopped at last in the small village of Colayo. There were about 500 adults and 150 children there. The team showed the Prodigal Son film. The people were amazed to hear the stories of Jesus in their own language. The following morning a man approached one of the team members. He wanted to accept Christ as his own Saviour and Lord. In total, 300 families plus many individuals from the different language groups, received GRN materials. We, at GR Philippines, are dedicated to spreading the Kingdom of God among the least reached people groups in our country, who have no other means of hearing the message of God's redeeming love in their heart languages. So again, today, "... at the trail's end in the heart of the Mountain Province, the Kalingas are listening to the divine 'peace-ballad'.." as Joy called it. Kawa-Saka is a combination of two words: Kawasaki (the Japanese motorcycle) and Saka - an Ilocano word which means "feet." The motorcycle is a popular means of transportation in the Philippines, especially in the mountains. For us at GRN Philippines, 'Kawasaka' means taking all modes of transport (including walking) in order to reach people groups with the Good News of Christ Jesus. 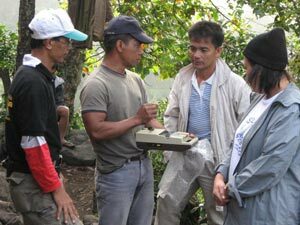 "After a week in the mountainous area of Kalinga, the Kawa-Saka team returned to Manila on April 27th. They had literally shared a mountain-top experience! The three GR staff and volunteers, gave testimony of how the Lord had given the Kalinga people opportunity to hear the Good News. They partnered with the Bible Christian Churches in Kalinga Province and the Vernacular Video Ministry for the mission trip. Together they held film shows that made God's Word come alive. There was always an overflow of people wanting to receive the GRN 'Good News' material after each show. One mother from the Balatok tribe was so elated at receiving the GRN materials, that she expressed her wish that her daughter and husband could find salvation too." "After 5 hours of hiking on the mountain, tears rolled on my cheeks but there was no option but to keep on going because we were not done yet. It was not easy to climb up that mountain. They live in such far distant locations but we finally arrived at the Colayo tribe. So many people, children and adults, are still in the process of being reached with the Gospel. Only those with a heart for mission to share the Good News and the love of God, can make it!" 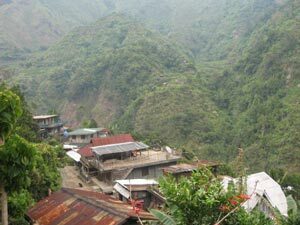 "A part of me was left in the mountains of Kalinga, captured by those people hungry for the Word of God, trapped in poverty and lost in spiritual darkness. The work of GR sparks a light that will brighten their path to salvation. My children and I were privileged to be part of that mission to take the Good News to them in the language they understand. Long live GR! To God be the Glory!!" 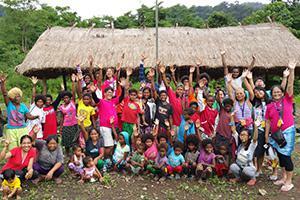 "We really appreciate how your team conducted the mission trip (Kawa-Saka) in our place. The people here are thrilled, rejoicing, so blessed to have received the recordings in the language we understand. We want to have more recordings of Bible stories and songs in our very own language, if that is possible? We would like to share it with our people up in the mountain of the Kalingas. -- NA & JB.